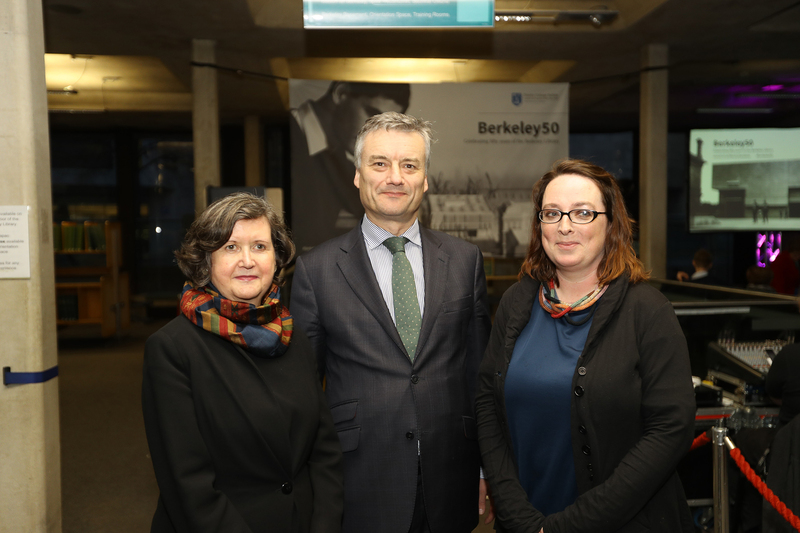 After speeches by the Provost of the University, and the Librarian and College Archivist, architectural and cultural historian Ellen Rowley gave a talk on the origins and impact of the Berkeley Library to over one hundred invited guests. Unusually, this event took place while the Library was open, allowing attendees to see the building in full operation. 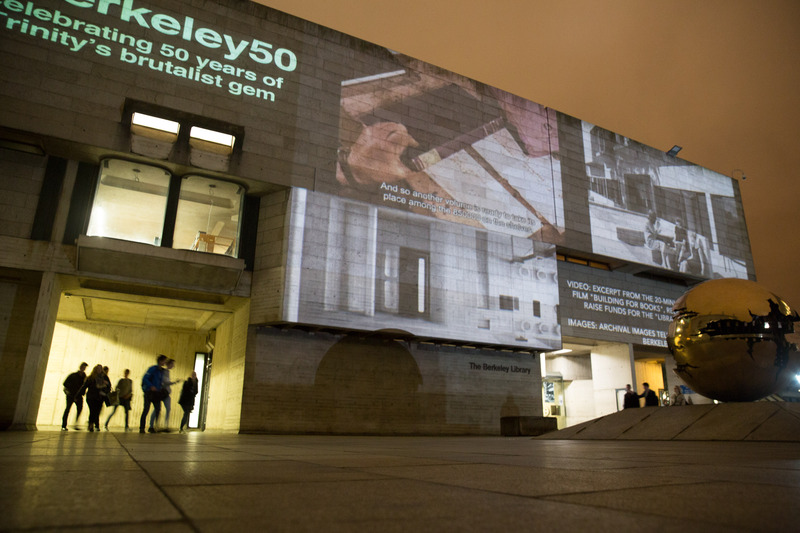 Following the launch event, Ellen Rowley reprised her talk on the origins and impact of the Berkeley Library for a wider audience of eighty attendees, followed by a screening of Building for Books, the film produced in 1958 as part of a fundraising campaign for the new library. This workshop explored the anatomy of the Wikipedia article and allowed participants to develop the skills to edit and cite content effectively. Participants had the opportunity to contribute to the world’s largest online repository of knowledge through the creation of high-quality content about the Berkeley Library and other important cultural institutions. 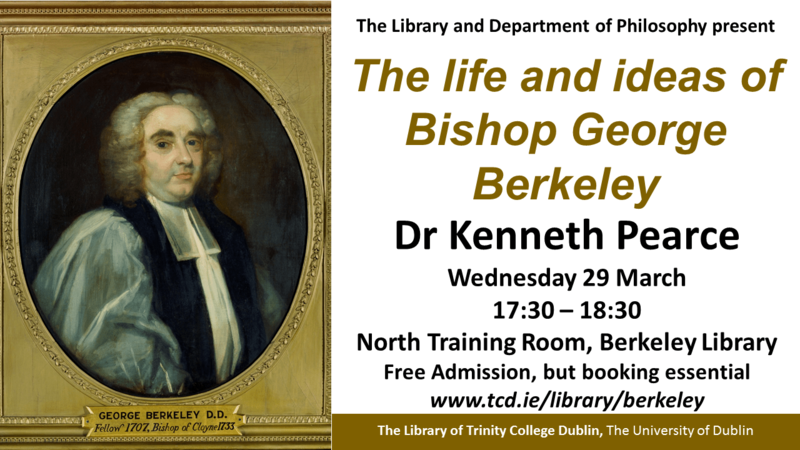 Kenneth Pearce, Ussher Assistant Professor in the Trinity College Dublin Philosophy Department, delivered an engaging lecture on the life and ideas of one of Trinity’s most illustrious alumni whose philosophical output places him in the great Western canon. 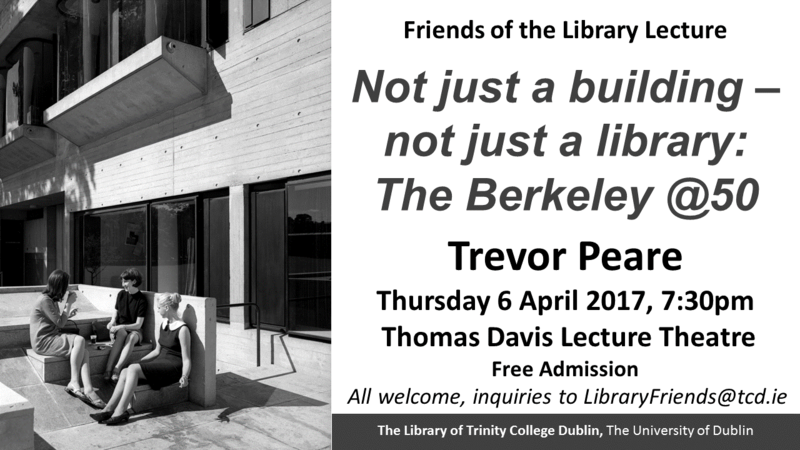 Trevor Peare, former Keeper of Readers’ Services in the Library of Trinity College and long-standing champion of the Berkeley Library, offered an intimate portrayal of the building and its inner workings, life and magic, concentrating on the people who had worked there over the first fifty years. The Moog Synthesiser went into commercial production in 1967, quickly establishing itself as the archetype for synthesised sound. This event sought to celebrate those fifty years of the Moog together with the first half-century of the Berkeley Library in a manner that would challenge traditional preconceptions about us. 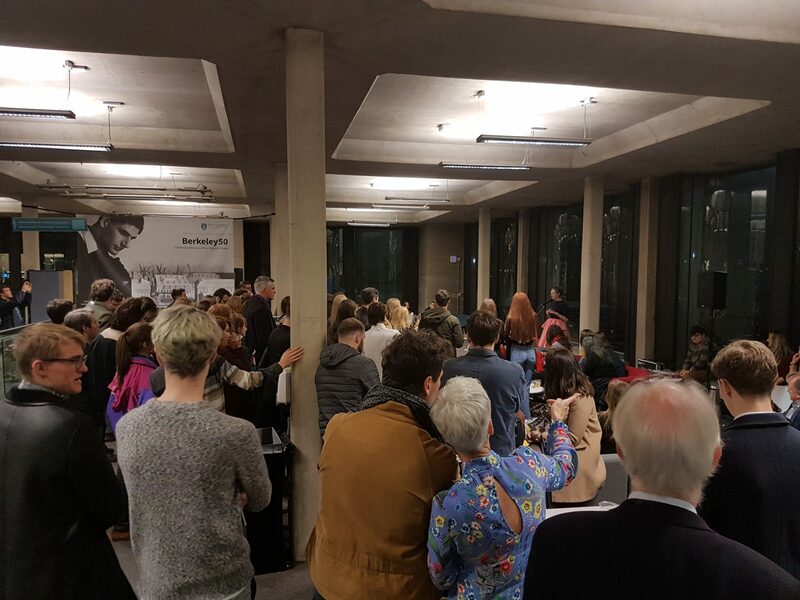 Over three nights, one of our training rooms was completely transformed as a venue for two dozen musicians and poets to perform, in a collaboration with the Department of Music and School of English. Using the raw concrete textures of the Berkeley Library as a backdrop, 1960s-inspired sonic and visual vistas were explored through the use of analogue synthesizer performance techniques and much more besides. Each night saw around seventy attendees. This tea party was organised to say thank-you to our retired staff, as an opportunity to catch up with old friends and colleagues, and to contribute to our ongoing effort to build a social history of the first fifty years of the Library. 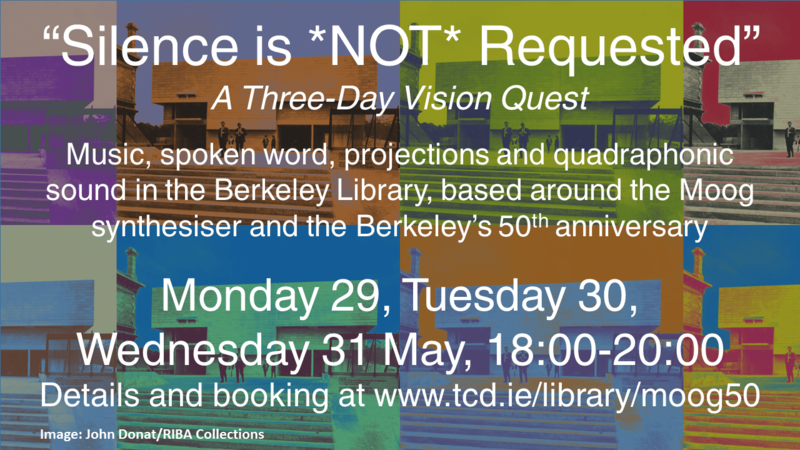 It also served to introduce current students from the Lir Academy to our former staff to gather stories to inform their forthcoming piece on the Berkeley (see below). 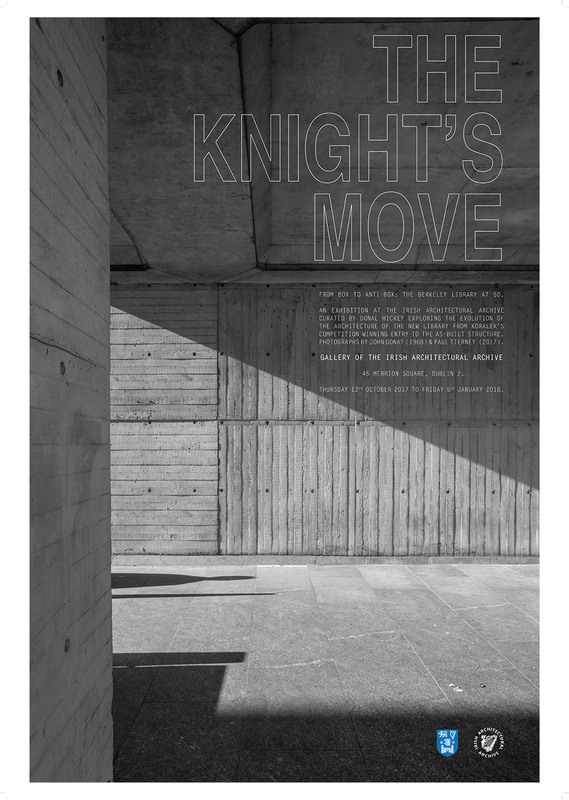 A site-specific and -responsive piece of work that was researched, created and performed by students of the Lir National Academy of Dramatic Art at Trinity College, based primarily on interviews the students had conducted with former students and also in a large part, Library staff. Directed by Irish director and playwright Louise Lowe, this formed part of the formal assessment for their studies. More details on the LIR performance: Part 1. More details on the LIR performance: Part 2. Rough Magic Theatre Company, one of the most influential and beloved theatre companies in Ireland, was founded 25 years ago by members of Dublin University Players. In 2017 they gifted the Library a quarter-century’s worth of their business archives as a birthday present to the Library. The public announcement was a popular summer event held in the Berkeley’s Iveagh Hall as part of the Berkeley50 celebrations. In 1960 Samuel Beckett donated the proceeds of a tour of his play Krapp’s Last Tape to the Berkeley Library fundraising appeal. 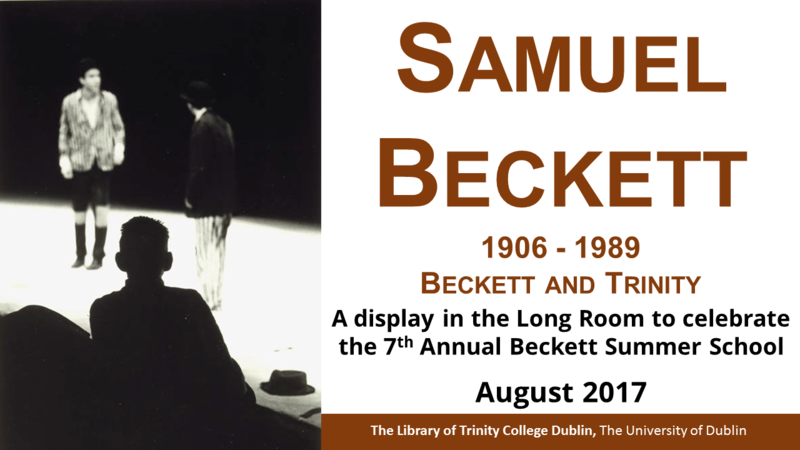 In August 2017, the Long Room hosted a small exhibition of items from the Library’s Beckett collection to coincide with the annual Samuel Beckett Summer School. This display highlighted Beckett’s generosity to the Library and included Krapp’s Last Tape materials. A special insiders’ tour of the Library by Library staff to Trinity alumni as part of the College’s annual Alumni Weekend, followed the next day by a talk on the architectural origins and context of the building by Irish architect Donal Hickey. Autumn saw the transformation of Iveagh hall into a vibrant social learning space with high quality furnishings sympathetic to the iconic brutalist architecture; Autumn also saw the commencement of a once-in-a-generation electrical upgrade to create a safer and more environmentally friendly building. An exhibition at the Irish Architectural Archive curated by leading Irish architect Donal Hickey, running for two months in the Architecture Gallery of the Archive. The launch event featured the unveiling of a new architectural model of the Berkeley in the finished design as built, and talks by the Librarian and College Archivist Helen Shenton and the architect Paul Koralek. More details on the exhibition and Koralek’s visit. The main event of the year… well over 400 guests came to hear the Berkeley’s architect speak about the Library. The video of the full event is available below. This also acted as the launch of the book The Berkeley Library and the Veil of Order: Paul Koralek in conversation with John Tuomey, bringing together the text of a 2005 interview with Koralek with some fabulous imagery of the building. More details on A Conversation with Paul Koralek. The Berkeley Library was open to the public as part of the Dublin contribution to the international Open House festival, offering a unique opportunity to explore its beautiful concrete textures and forms up close. During four hours and eight tours, two members of Library staff gave tours to over two hundred people. 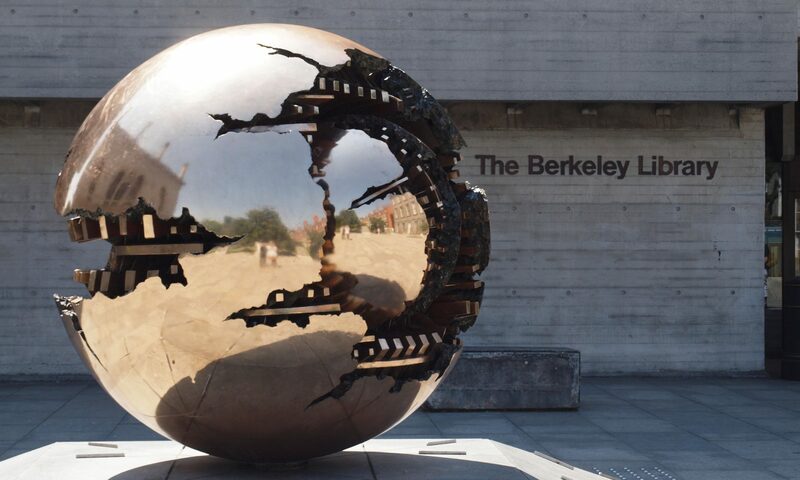 The Berkeley was one of the key themes of the fourth issue of FRANC Magazine, one of the promising start-up companies emerging from the LaunchBox accelerator programme which is based in the Berkeley Library. The new issue was launched at a packed evening event in the Berkeley’s Iveagh Hall. More details on the FRANC launch. Dr Carole Holohan is the Assistant Professor in Modern Irish History at Trinity College Dublin. 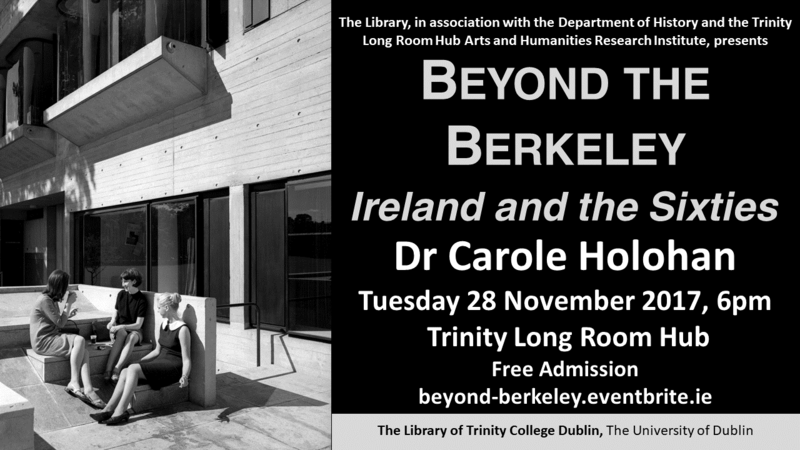 In this lecture Dr Holohan addressed broader societal changes in the decade that gave us the Berkeley Library, with particular attention to how economic, social and cultural developments affected young people, at a time when the meaning of youth, and the nature of youth culture, was changing both in Ireland and internationally. To act as our swansong, we pulled together the best of the images and film taken throughout the year, and in the proceeding fifty years, to project on to the facade of the building. More details on our illuminations.